Fig. 13.7. 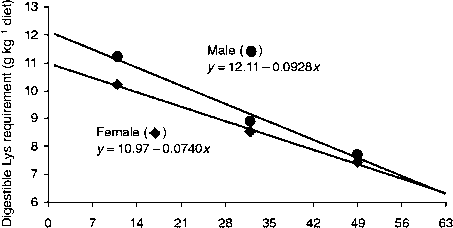 Plot of the digestible Lys requirement (y) of male (•) and female (♦) broiler chicks as a function of age (x) for diets containing 13.4 MJ kg 1 metabolizable energy (ME). The requirement values for 0-21 days of age (average = 10.5 days) came from Han and Baker (1991, 1993), for 21-42 days of age (average = 31.5 days) from Han and Baker (1994), and for 42-56 days of age (average = 49 days) from NRC (1994). Table 13.5. Summary of true digestible requirements of male chicks fed a maize gluten meal semipurified diet during the second and third week of life: extrapolation to ideal ratios relative to lysine. aBased on Assays 1-6, using the higher of requirement estimates for gain and gain/feed ratio. Requirement values were ratioed to the average Lys requirement for gain/feed of 9.60 g kg-1. Table 13.6. Predicted requirements (g kg 1) for digestible amino acids in broiler chicks at three different growth periods3. aThe digestible Lys requirement for each age group was calculated based on the equations presented in Fig. 13.7, after which the ideal AA ratios were used to calculate requirements for the other amino acids. A dietary ME value of 13.4 MJ kg 1 is assumed for all age periods. bSAA, sulphur amino acids. °Based on the report of Emmert and Baker (1997), the ideal Thr:Lys ratio is projected to be 2 percentage units higher for the 21 -42 day and 42-56 day age periods than for the 0-21 -day age period. 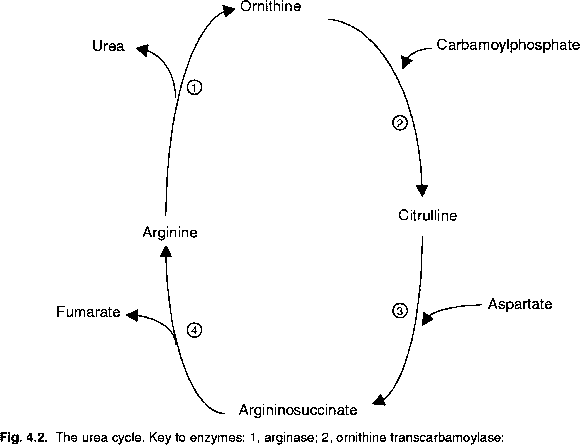 purposes of calculating the digestible lysine requirement. 1999). Mack et al. (1999) evaluated breast yield as well as weight gain and feed efficiency in their AA requirement studies. Among the AA studied (lysine, methionine, threonine, tryptophan, arginine, isoleucine and valine), there was little evidence that the requirements for maximal breast yield were higher than the requirements predicted for either weight gain or feed efficiency.